Back Testing: A strategy optimized on historical data, that is then applied to current data to compare if the results are similar. Rarely done properly and usually resorts to a form of curve fitting. Bar Chart: A popular way to display and analyze price action in graphical form using bars instead of a line, candlesticks, or area. Basing: A time frame where price action is said to be “catching its breath” after a decline, which is defined by a flat trading range without any obvious trend. It is common to see a basing period after a lengthy decline. Basing may also be a sign of accumulation. Basis: Difference between cash prices and the futures contract prices. Bear: Also referred to as “being bearish,” a trader/investor who believes prices will decline. Bear Market: An extended period of time when general prices in the market are declining. It is often measured by a percentage decline of more than 20%. Bear markets occur when approximately 80% of all stocks decline for an extended time period. 1973-74 and 1981-82 have been referred to as bear markets. Bear Trap: A scenario that occurs when price action breaks below a certain level to generate a sell signal, only to reverse course and negate the sell signal, therefore “trapping” bears that acted on the signal. A bear trap is another form of whipsaw. Bearish Divergence: An occurrence when price action makes a higher high while an indicator makes a lower high. The indicator does not confirm the higher high, therefore indicating a potential reversal. Divergences occur most commonly with momentum oscillators. Below the Market: A limit order to buy or sell at a specific price that is lower than the current price. If price action does not reach this price, the order goes unfilled. Bid: The price that market makers guarantee to fill your sell order. A market sell order will usually be filled at the current bid price. The bid price is typically lower than the ask. See also All About Bid/Ask Spreads. Black Box: A computerized trading system in which the rules of are not disclosed. Blanket Assurances: See easy to borrow. Block Trade: The sale or purchase of a large amount of shares. Anything transaction over 10,000 shares, or worth over $200,000 is considered to be a block trade. Blue Chip Stock: A public company that is well known and thought to be in good financial condition by having strong fundamentals (i.e. profitability, earnings). A long term investment in a blue chip is widely considered by the average long-term investor to be a “safe investment.” Examples of blue chips would include Wal-Mart, GE, and Coca-Cola. Borrow: In short selling, you must borrow shares from your broker to sell prior to buying the shares back. Because you don’t own the stock you’re short selling (you borrowed and then sold it), you must pay the lender of the stock any dividends or rights declared during the course of the loan. If the stock splits during the course of your short, you’ll owe twice the number of shares at half the price. Box Size: Used in Point & Figure charts, box size is the price value of one “X” or one “O”. An X displays when price action rises by the box size, with an O displaying when price action falls by the box size. Increasing the box size filters smaller movements. Breakaway Gap: A gap in price action that forms at the completion of an important pattern. A breakaway gap signals the beginning of a significant price move. Breakdown: Price action of a stock that “breaks” a pattern to the downside. The price “breaks down” below the low trend lines that enclose all other prices in the pattern. Breakout: Price action of a stock that “breaks” a pattern to the upside. The price “breaks out” above the high trend lines that enclose all other prices in the pattern. Bull: Also referred to as “being bullish,” its a person who believes prices will go up. Bull/Bear Ratio: An indicator that shows the relationship between bullish and bearish advisors. It is read as a contrary indicator, so if it reflects extreme bullishness, the market is likely near the top. Bull Market: An extended period of time when prices within the overall market are generally increasing. Bull Trap: A scenario that occurs when price action breaks above a certain level to generate a buy signal, only to reverse course and negate the buy signal, therefore “trapping” bulls that acted on the signal. A bull trap is another form of whipsaw. Bullish Divergence: An occurrence when price action makes a lower low while an indicator makes a higher low. The indicator does not confirm the lower low, therefore indicating a potential reversal. Divergences occur most commonly with momentum oscillators. Bump and Run Reversal (BARR): A reversal chart pattern that occurs after speculation drives price action up too far, too fast. It is designed to identify speculative pushes that are not sustainable for a longer period. 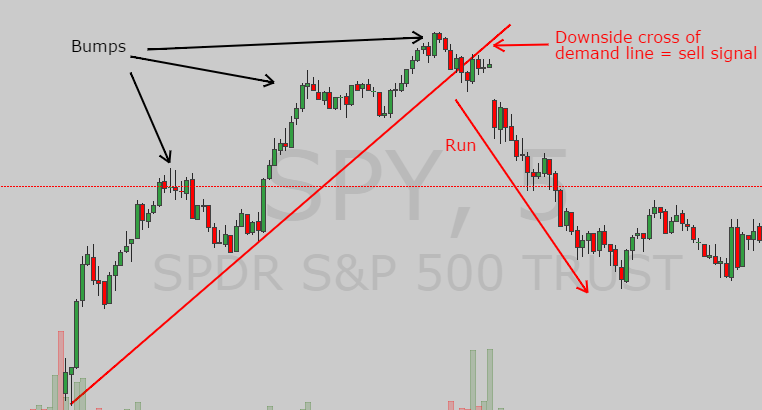 A downside cross of the trend/demand line is and indication of early reversal. See more about the BARR pattern. Buy Stop: A buy order that is typically placed above the current price, which ensures that a stock would have to trade at the specified level before the buy order is activated. By putting a buy stop order just above resistance, you can ensure that price action will break resistance before you go long. Buyback: A company’s repurchase of it’s own shares of stock. Buy-In: Sometimes in a short sale, it will be necessary to buy the stock back and close the position for regulatory purposes. This is called a forced buy-in, and is a risk you take when initiating a short position. Firms have an obligation under SEC Rule 204 to make delivery to satisfy settlement requirements with the buyers. If your short sale contributes to the inability to make a delivery, you could be forced out of your position. Sometimes, the lender of the shares will recall their shares, and occasionally it is necessary for you to buy back the shares so they may be returned to the original lender. You will receive no prior notice for this. Another situation which could result in a forced buy-in is if your broker is no longer able to borrow shares for your short position. If this is the case, you will receive a notification informing you that you may need to close out your position by the following business day, or the broker may buy-in your positions for you. Buying on Margin: A risky trading strategy where a buyer will borrow money from their broker to make the trade. The buyer believes the stock price will rise and is trying to maximize profits by investing more money in the stock than they have on hand.